The International Residual Mechanism for Criminal Tribunals (Mechanism) has launched an exhibition of selected material from the archives of the International Criminal Tribunal for Rwanda (ICTR). Entitled ICTR: Looking Back, the exhibition was prepared by the Mechanism Archives and Records Section (MARS) to mark the 25th anniversary of the founding of the ICTR by highlighting the importance of the ICTR and its work through significant events in the Tribunal’s history. The exhibition features selected copies of judicial records, photographs, publications, artwork and material related to the work of the Office of the Prosecutor and the United Nations Detention Facility. This exhibition follows ICTY: Looking Back which was on display at both branches of the Mechanism throughout 2018. 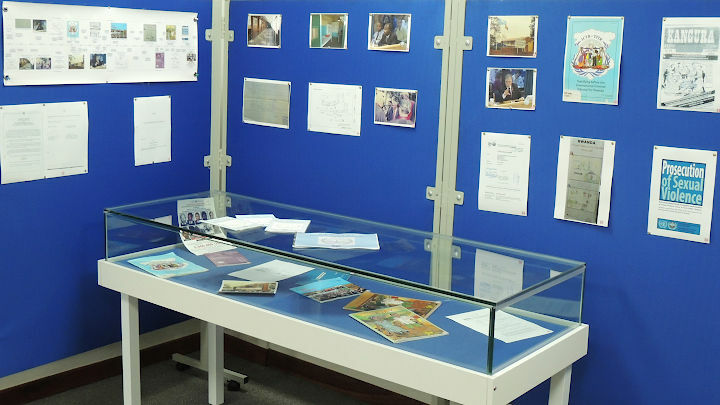 The exhibition ICTR: Looking Back will be on display throughout 2019 in the archives research room of the Mechanism’s Arusha branch and in the lobby of The Hague branch. With the completion of the respective mandates of the ICTR and the ICTY, thousands of linear metres of physical records and petabytes of digital records generated as a result of their work have been transferred to the custody of the Mechanism. The management of the archives of the two Tribunals, including preservation and long-term access, is one of the Mechanism’s core areas of responsibility. If you have any questions or comments about the exhibition or the Mechanism’s archives in general, please contact MARS at marsarusha[at]un.org (Arusha branch) or marshague[at]un.org (The Hague branch).